ASBP are pleased to support ChemSec Marketplace, a database that recommends safer alternatives to hazardous chemicals. In recent years an increasing number of construction companies have started to look for materials built on sustainable chemistry. This is driven by both stricter chemicals legislation as well as increased customer awareness. Unfortunately, safer alternatives to hazardous chemicals are often hard to locate on the market. To connect supply with demand the non-profit ChemSec have created a unique e-marketing website: Marketplace. Marketplace allows companies to create their own ads on the Marketplace website, including product description, images, brochures and logotypes with full control over the way their product is presented. Creating an ad is effortless – expect to spend only 10-15 minutes to get your ad up and running. Website visitors may browse, filter or search advertisements based on chemical application, function, industry and more, to find what they are seeking. In many ways Marketplace resembles eBay or airbnb. But instead of searching for vintage watches or a two-bedroom apartment in Paris, you go on Marketplace to find a non-halogenated flame retardant or a sustainable anti-corrosion coating. If you can’t find what your company is looking for, Marketplace lets you post requests to address your needs. Marketplace welcomes all kinds of safer alternatives that can replace hazardous chemicals: Drop-in substitutes, new innovative materials, process tweaks and/or technical solutions. There are several benefits of advertising with Marketplace. It is a direct channel into the chemical departments of some of the world’s largest construction companies that are on the lookout for new solutions. 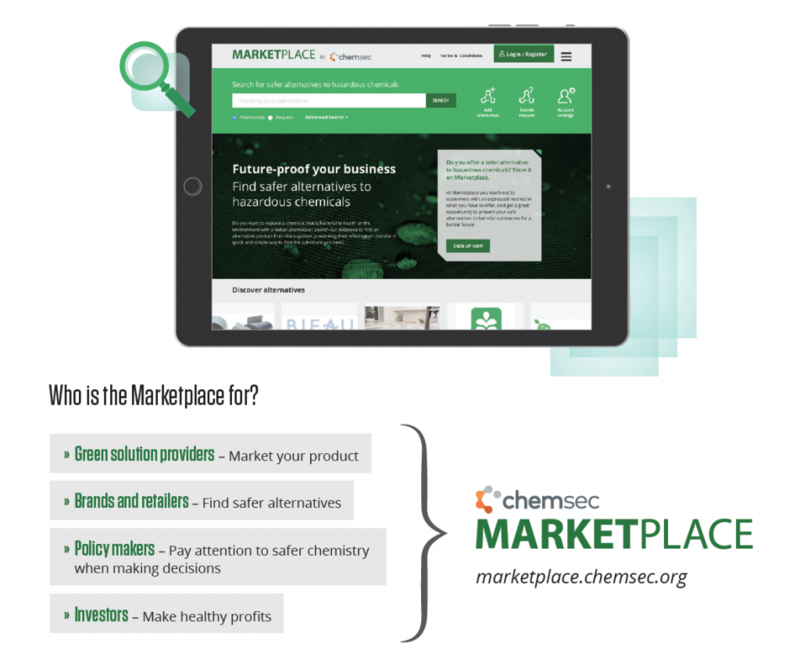 Marketplace creator ChemSec holds a vast global network of companies and is constantly travelling to fairs, arranging meetings, webinars to promote the Marketplace and the products on it. In addition, some of the world’s largest chemical companies are also using Marketplace and/or keeping it on their radar. This means there is a real chance for companies on Marketplace to attract new investments. ChemSec has a multi-year project plan for Marketplace and new features and outreach activities will be rolled out on a regular basis. And the best part of all – as of now Marketplace is free-of-charge for early adopters. Funders who really believe in Marketplace’s potential to change the way safer alternatives are made available are backing the project.